Phil and I influence each other’s gastronomic likes and dislikes. Before we met I wasn’t fond of sushi, couldn’t understand all the passion for guacamole, and twisted my nose at maple syrup. Now I’m addicted to sushi (with no intentions of rehab), I’ll eat guacamole any time, and I can’t imagine a blueberry pancake without the heavenly nectar drizzled on top. Phil, on the other hand, wouldn’t touch a raw tomato, felt queasy around foie gras, and didn’t like the smell of goat cheese. Those days are over, which is great, because I didn’t want to skip this pasta, with creamy goat cheese enveloping cremini mushrooms and arugula. You can use any pasta shape you prefer, but pick a mild goat cheese that will quickly melt in the hot pasta. Bring a large pot of salted water to a boil, and cook the pasta until al dente. Heat the olive oil and butter on a non-stick skillet, add the garlic and saute for a couple of minutes. Add the sliced mushrooms, season lightly with salt and pepper. Cook the mushrooms until they release liquid and it almost completely evaporates. Reserve, keeping warm. When the pasta’s ready, reserve about 1/2 cup of the cooking water, drain the pasta, return to the pot and add the cremini mushrooms, arugula, goat cheese, and parsley. Gently toss everything to wilt the arugula, add some of the pasta water to get a smooth consistency, adjust the seasoning, and serve. Comments: If you don’t like goat cheese, then this pasta is not for you, just skip it, because the “flavor of the barnyard” (as Phil calls it) is pronounced in the sauce. The original recipe called for regular arugula, but instead I used baby arugula because the sharpness of the goat cheese pairs better with a milder green. If you want to tone it down even more then use baby spinach, or even Swiss chard, although you’ll have to saute it first. My other adaptation was to skip the 1/2 cup of olive oil that was intended as its “finishing touch.” Despite my love for olive oil, I’d never add 955 calories of fat to a pasta that’s perfectly fine without it. I am not a fat-o-phobe, but have my limits. We like to go vegetarian one day during the week, and this is a great option if you’re trying to skip meat whether occasionally or permanently. It’s delicious! 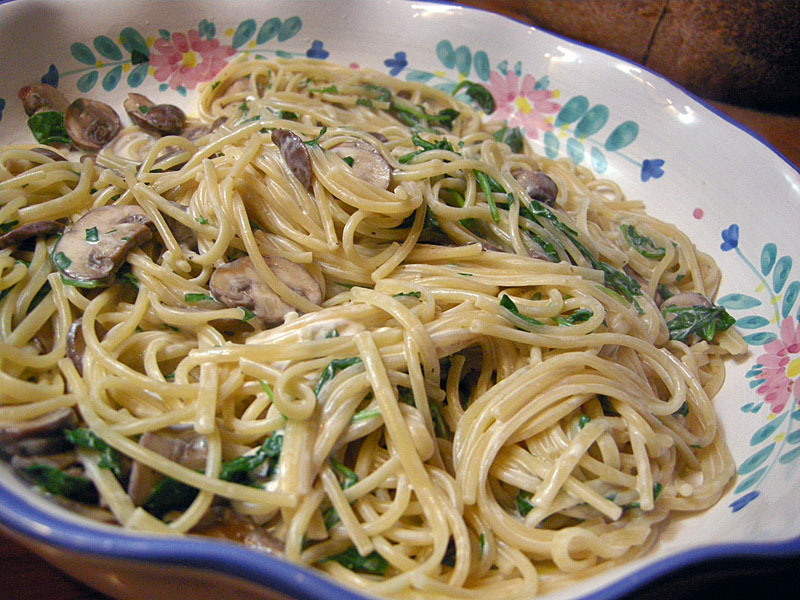 Note to self: to make it even faster, saute the mushrooms in advance, and re-warm them right before adding to the pasta.